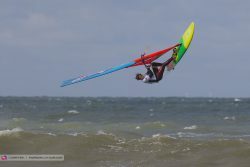 With Klitmoller being windless all hope was on Sylt to deliver some good conditions for the 4th wave competition of the year. 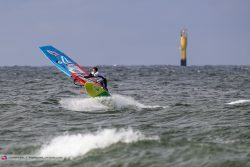 With only wind & waves predicted on registration day an exception was made by the organisation to already start competing on Friday instead of Saturday. 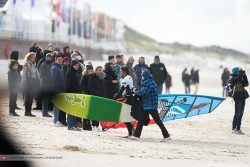 The last time there was a full elimination done on Sylt was back in 2012 so everyone was happy to go out and tackle the mean shore break of Sylt. As there wasn’t much hope to do a double elimination I knew I had to sail at my best to keep my top 16 on the overall and pass into the next round. 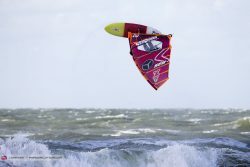 I was on my biggest sail 5.2 and thankfully could borrow Danny Bruch his 86 to get me through the shore break. 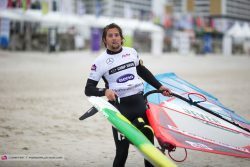 Never using the board before I wasn’t sure how it was going to go but in the end I managed to sail a pretty good heat (conditions wise) and advance against Adam Lewis who couldn’t really find a second wave. 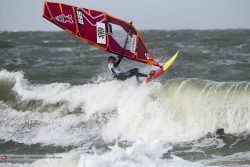 Next up I was against Kenneth Danielsen, the wind got stronger so I decided to go to my smaller gear (4.8 and Kode 80). The wind was even more onshore at this moment and getting out was getting really hard with a really strong current & shore break. 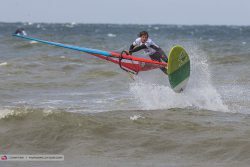 I really struggled in this heat and nothing seemed to work, my jumps where average and finding waves seemed impossible. After having one all right wave I got caught on the inside and with 5 more minutes to go I couldn’t make it out anymore making me lose the heat quite close to make top 8. Bummed but also happy to confirm my level from Tenerife and even get higher in the overall moving to a 13th place!! 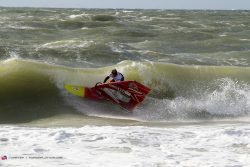 After the wave was done I could fully focus on the Freestyle, being ranked 5th I still had a little outside chance to make the Podium in case I sailed really good and Yentel would make a big mistake. My main goal however was to keep improving my results and end the year with a podium! On Monday the wind finally kicked it from the north making it really cold but also changing the conditions a lot compared to past contests! 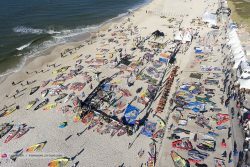 The wind was really good during this day (gusty but strong) as I sailed almost every single heat on my Freek 4.8 and Flare 103 . My most important heat was probably the one against Yentel, I had to win this to make the semi finals and keep the chances alive to still make top 3 on the overall. I found a really good rhythm and managed to finally make it into the semi finals again during a single elimination! After losing really close against Golitto (2points) I managed to take the 3rd place in the losers final. Definitely a good day in some really good conditions! 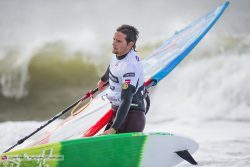 On Thursday the double elimination got started in similar but lighter wind conditions than in the single, the wind was definitely lighter during this day and Yentel made an amazing comeback fighting all the way back to 5th and securing his well deserved top 3 place on the overall! By the time it was my heat the wind dropped too much making it a waiting game till the last day. The last chance… On day 10 was the last chance of competing, ice cold and not much wind on the forecast definitely caught me of guard. I had my mind already on the price giving that afternoon and before I knew it it suddenly got windy. With only needing one hour to finish the double elimination it was all or nothing. After Adrian Bosson made it passed Yentel in a close heat it was up to me to defend my podium. We started the heat well but after just 2 min. the wind swung offshore and died off, heat cancelled and time to wait on the beach. It was probably the worst thing ever, as it wasn’t even 10°C and I couldn’t find a way to get myself warm leaving me shaking in the cold. After waiting 15 min the wind picked up a bit again for our biggest sails, still being gusty but with longer heats it should be possible to compete. During the first 3 min of the heat I didn’t really managed to find the right gust to start of the heat well, I crashed 2 times one of the more basic moves and had to play catch-up from of the beginning as Bosson managed to get more upwind in the area at the start and score some good moves from the get go! In the last 6 minutes the wind picked up and I managed to still catch up quite a bit but in the end just missed a power move on the way in making me lose my podium place on the last day of competition… Bummed, a cold shower after a week of waiting and thinking you secured the podium. Another lesson learned, but still a good finish of the season climbing up from 9th to 4th during the year. 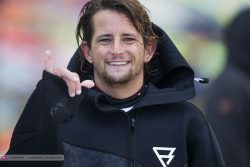 No podiums this year on the PWA but with how the level is now I’m more than happy to know I still have it in me to be one of the best Freestylers in the world. After a winter with not much training due to a foot injury I’m more than happy how it went and have a lot of motivation to go for that top spot again one more time in 2017!! Now its already time to start the next event at Brouwersdam for the Dam-X event, hosting the final stop of the EFPT tour from 2016. The forecast is good and lets see if we can finish this year’s freestyle season with a bang!